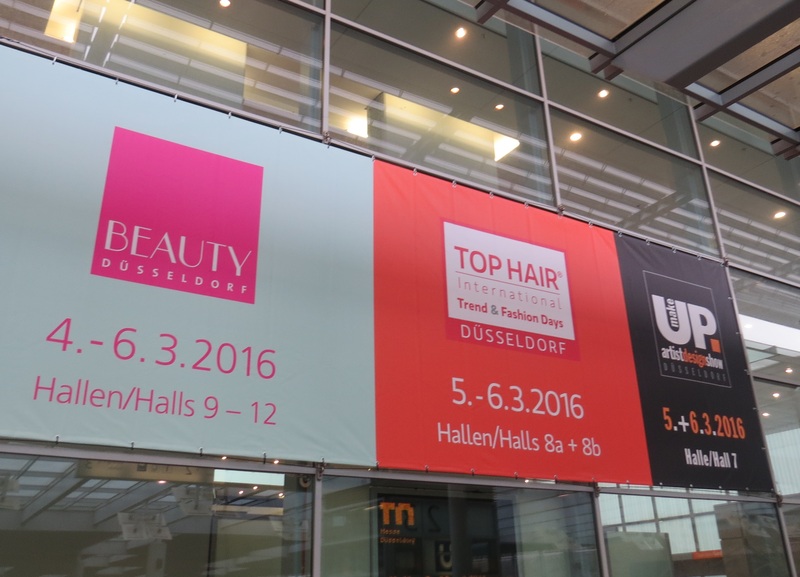 Last weekend I was in Düsseldorf to visit Beauty International, Germany’s biggest salon trade show. Beauty International (actually, it is now called Beauty Düsseldorf) celebrated its 25th anniversary last year (here is my show report about Beauty International 2015) and, as always, the trade show took place concurrently with Top Hair (Germany’s biggest hair salon trade show) and Makeup Artist Design Show (makeup artist/professional brands). It is one of the key dates for the German (and European) salon industry so Düsseldorf’s trade show centre was packed! According to the trade show organizers, 55.000 trade visitors visited the fair from 4th to 6th March. There were 1.500 exhibitors across four halls: Foot Care, Spa & Wellness in Hall 9, Salon C&T in Hall 10 and 11 and Nails in Hall 12. Read on for an overview of my favourite brand launches at this year’s Beauty Düsseldorf trade show! Germany has a number of strong salon brands which have a significant international presence – the big names include Klapp Cosmetics, Babor, mbr, Dr. Grandel, Jean d’Arcel, Reviderm and Janssen Cosmeceuticals – as well as a host of mid-sized professional beauty brands like Gertraud Gruber, Dr. Rimpler, Charlotte Meentzen, Dr. Belter Cosmetics, La mer, Dr. Spiller or Rosa Graf. An interesting fact: almost all of the above companies were founded by beauticians/dermatologists/medical professionals (and named after their founders!) and the majority of them are still family-owned. The Spa & Wellness section at Beauty Düsseldorf is always worth a visit: this year, there was a special exhibition on Natur & Spa and, of course, the annual Wellness & Spa Innovation awards. 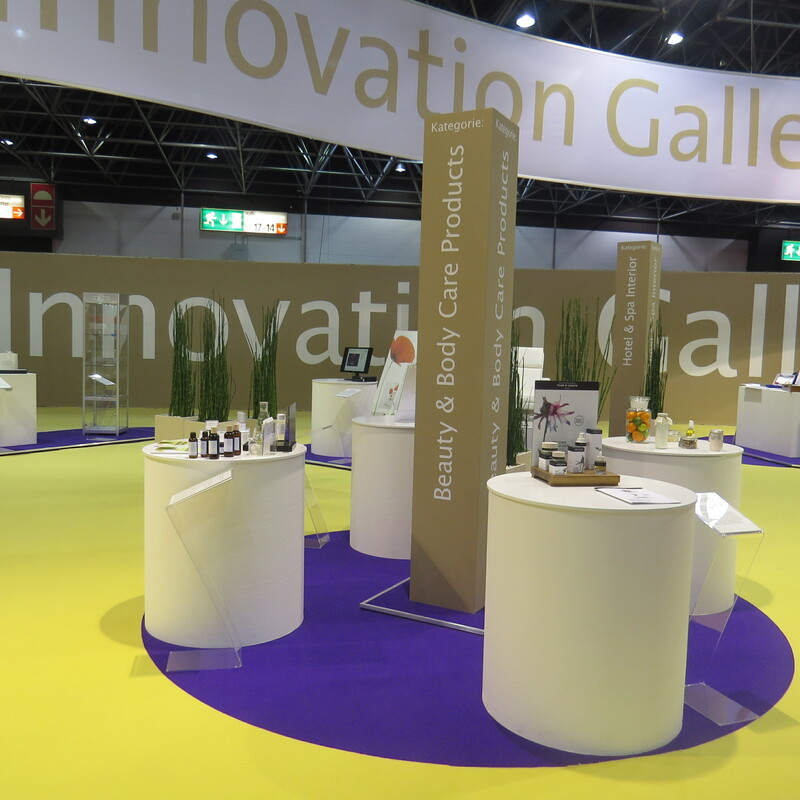 There are four categories: Beauty & Body Care Products, Beauty & Body Care Treatments, Hotel & Spa Interior and Hotel & Spa Concepts and the nominated products were displayed in the Innovation Gallery. Always an interesting feature. 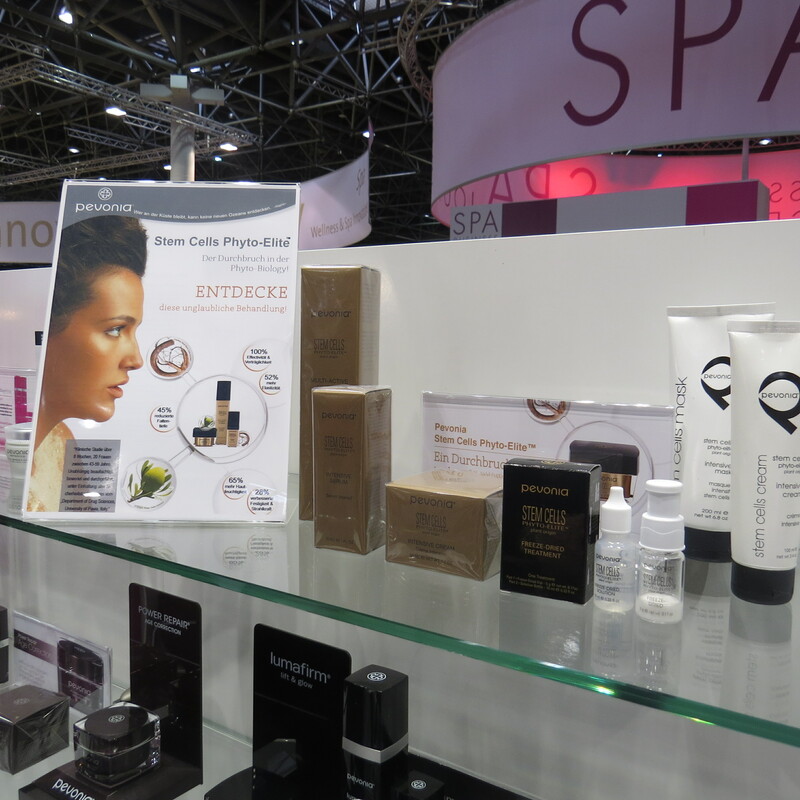 Organic US spa brand Pevonia was a first-time exhibitor at Beauty Düsseldorf. Pevonia specializes in anti-ageing face and body care; products are available in spas, hotels and salons with an upper premium price tag (from 76-200 Euro). 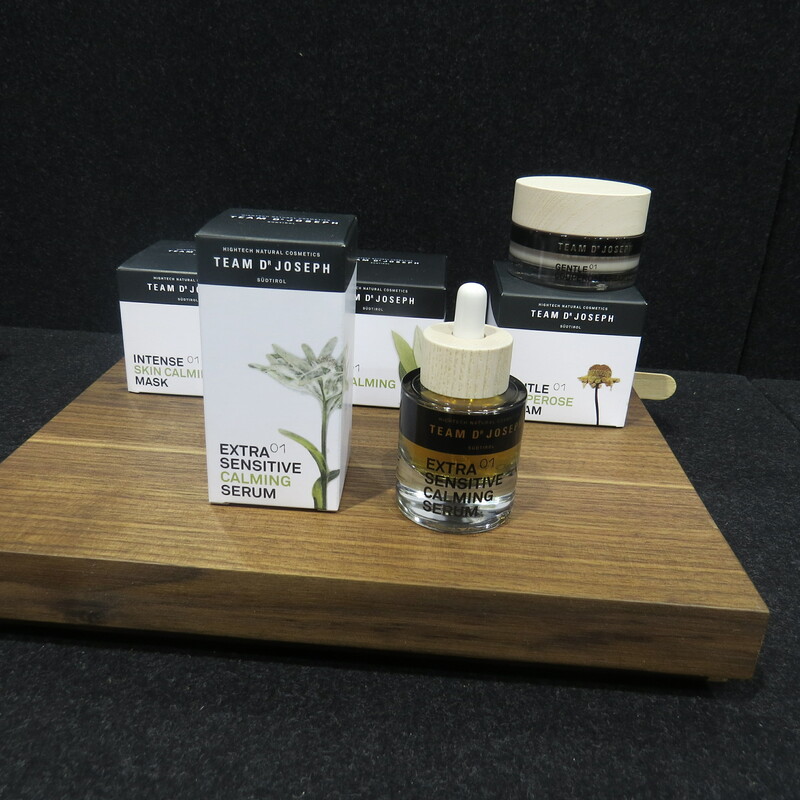 At the trade show, the company presented its latest launches, including the Stem Cells Phyto-Elite face care range from 2015 which is formulated with plant stem cells derived from argan oil and comfrey extract. The product line-up includes a cleanser, a serum and a face cream; there is also special treatment which consists of freeze-dried powder and a liquid which are mixed together and then applied to the face. Spa Ritual is another well-established US brand. The company was founded in 2006 and is probably best known for its nail polishes and hand care products. However, Spa Ritual’s range also includes body care and the very latest launch was the beautifully packaged Yuzu Rose range. Yuzu Rose comprises a dry body oil, a sugar scrub, body wash, bath salts and a body butter; products are packaged in eye-catching pink and yellow which reflect the colours of the main ingredients: the Japanese yuzu citrus fruit and the classic rose. The Wellness section of Beauty Düsseldorf also includes several non-beauty spa-related exhibitors – like Vitajuwel. Vitajuwel is a German company which manufactures elegant drinking water carafes and glass bottles equipped with crystals and semi-precious stones. The crystals help to purify the drinking water and charge it with positive energy – many spas and high-end hotels use these type of water carafes. Vitajuwel also produces a range of exquisite crystal phioles; these are little glass vials filled with different semi-precious stones and crystals – they have a “wellness” vial, for example, which contains rose quartz, amethysts and rock crystal while “Sunny Morning” is a more invigorating mixture of orange calcite and rock crystal. The crystal vial is then suspended in the water bottle or carafe. There was also charming tea brand from the Chiemgau area of Southern Germany, Bioteaque. Founded in 2008, Bioteaque’s extensive tea portfolio is available exclusively in high-end hotels and spas. There are some exquisite tea blends (green tea, black tea, fruit tea and so on) but the brand also offers an Alpenkräuter (Alpine herbs) tea range which is composed of local herbs and flowers: linden blossoms, peppermint and cornflower, Melissa, lemon verbena or rose petals. 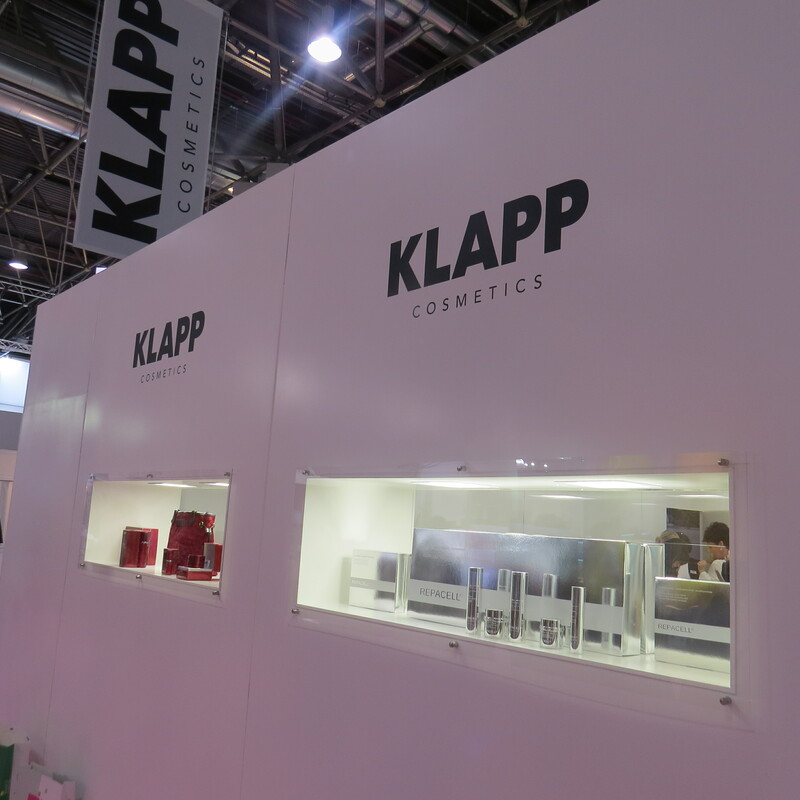 Klapp Cosmetics is one of the major players in the European salon market and they also have a massive international presence outside of Europe. The German brand’s products are distributed in around 60 countries across the world (I had last seen the company at Cosmoprof Hong Kong 2015). As always, Klapp introduced a whole range of product innovations at Beauty Düsseldorf, including a brand-new face care range launched together with German designer Thomas Rath. 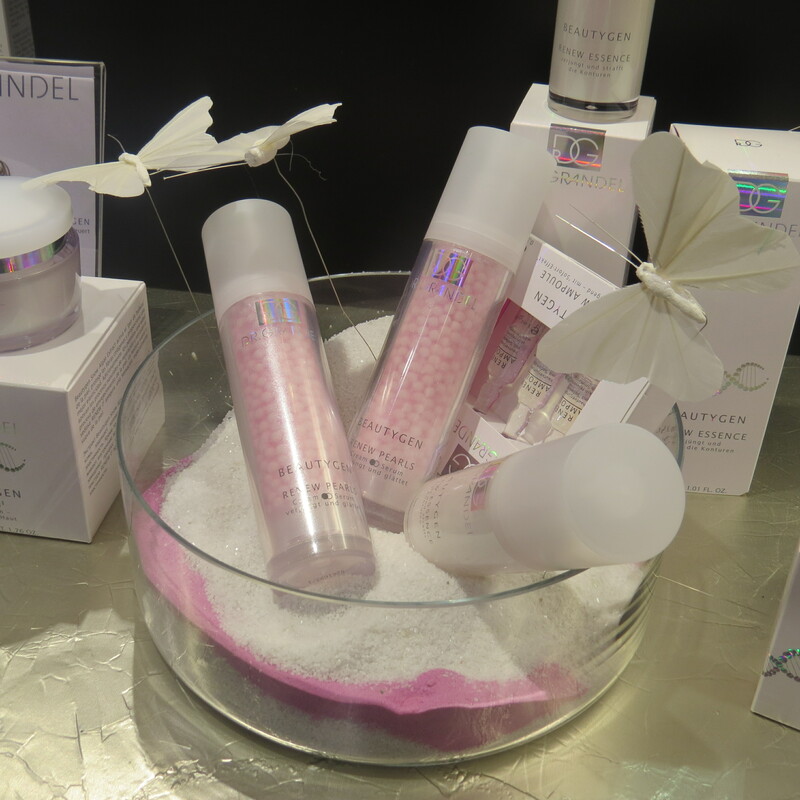 TR Skin Couture comprises ten products: cleansing lotion, toner, scrub mask, two day creams (one for normal skin, one for dry skin), eye cream, décolleté cream, a silk serum, treatment ampoules and a hand cream. The brand’s organic Kiwicha range, originally launched in 2015, was extended with four new products (a cream scrub based on finely-ground cocoa bean shells, an overnight cream mask (sleeping mask! ), a moisturing fluid and a volcanic clay mask). There is also a new ampoule treatment in the Power Effect range, a stem cell-based Skin Booster in the YouDerm range, a Hyaluronic Cream with SPF 30 and a fabulous new cream in the best-selling anti-ageing range Caviar Power: a black jelly cream! Gorgeous texture (jelly textures are very Asian!) which feels cools and fresh on the skin. 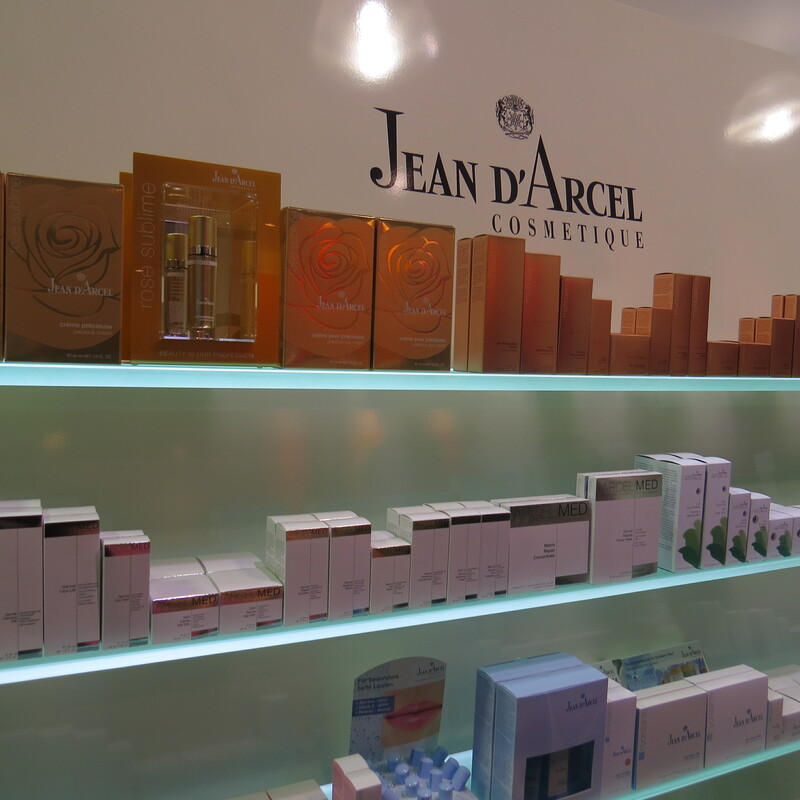 Jean d’Arcel is another big brand in the European salon industry. The brand’s new launches were mostly line extensions and limited editions but there was also an interesting-looking new skin care range, Rose Sublime, which was introduced in summer 2015. The line-up includes three products: an eye cream, a face cream and an intensive serum. And one of Jean d’Arcel’s newer product ranges, the cosmeceutical/dermo sub-brand ArcelMed, was extended with the Dermal Peptide Powder Mask, a classic Asian-style sheet mask. I saw sheet masks on various exhibition stands in halls 10 and 11; there was also a Chinese own label mask manufacturer, NBC (Nox-Bellcow), who offered exactly these type of face masks. I ought to add that the classic face mask format in Germany (and Europe) is the cream mask; sheet masks (uber-popular in practically all Asian countries) are still quite difficult to find in drugstores and perfumeries. However, they seem to be making an entrance into the German salon market at last. Another big beauty trend from Asia are sleeping masks/sleeping creams – special night-time skin care treatments. Sleeping creams have already appeared in the German and European mass market (courtesy of L’Oréal’s Garnier brand which started the ball rolling with its Garnier Miracle Sleeping Cream Mask in early 2015) so it’s not really surprising that they have also started to play a role in the take-home ranges of the big salon brands. Which brings me to one of the new launches of German salon brand Babor: one of Babor’s signature ranges are the ampoule face treatments – and this line was just extended with a Sleeping Ampoule which contains an intensive night-time serum. 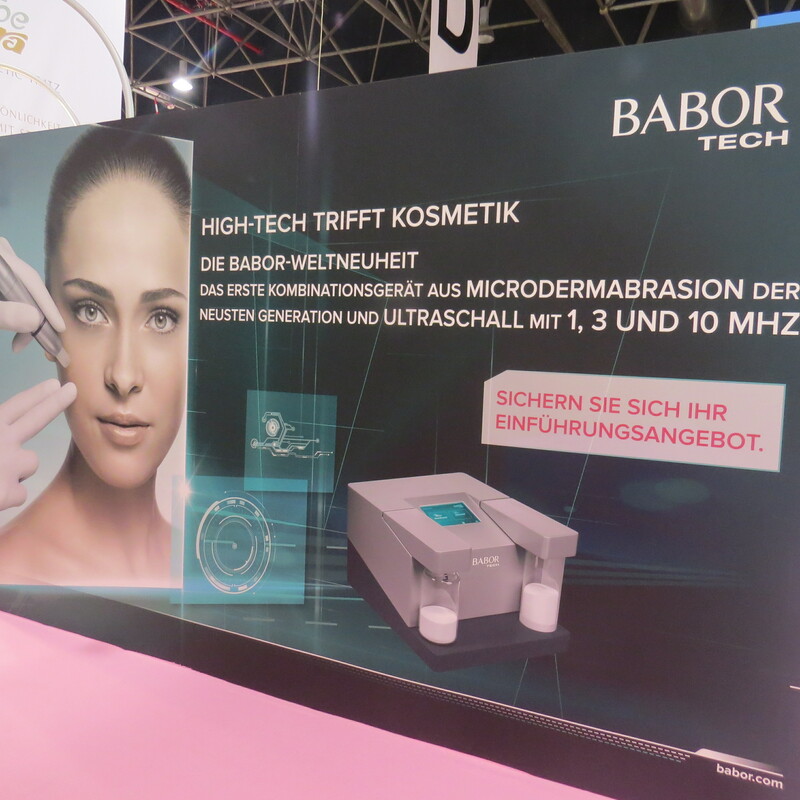 However, the biggest Babor launch was a microdermabrasion device which combines ultrasound with microdermabrasion. I’m not an expert on technical salon equipment (I usually write about cosmetic products rather than the actual salon “hardware”) but I was told that the combination of these two treatments, ultrasound and microdermabrasion, in one piece of equipment is quite novel. The company is also currently relaunching its Doctor Babor cosmeceutical/dermo range; I was told that some products will be cut from the current line-up in order to focus more on the medical and cosmeceutical aspect of the treatment range. Reviderm is another German salon brand which specialises in anti-ageing dermo treatments like microdermabrasion and micro-needling. In case you’re unfamiliar with micro-needling: in this kind of cosmetic treatment the top layer of the skin is punctured by tiny needles. These micro injuries stimulate the skin’s own healing processes (they increase the collagen production); often anti-ageing or hydrating treatments are applied to the skin directly after a micro-needling treatment so the active ingredients can penetrate the skin and further boost the healing process. The company’s latest launches include the Reviderm SkinNeedler: a slender micro-needling tool which is described as being much gentler and more effective than traditional dermo rollers. 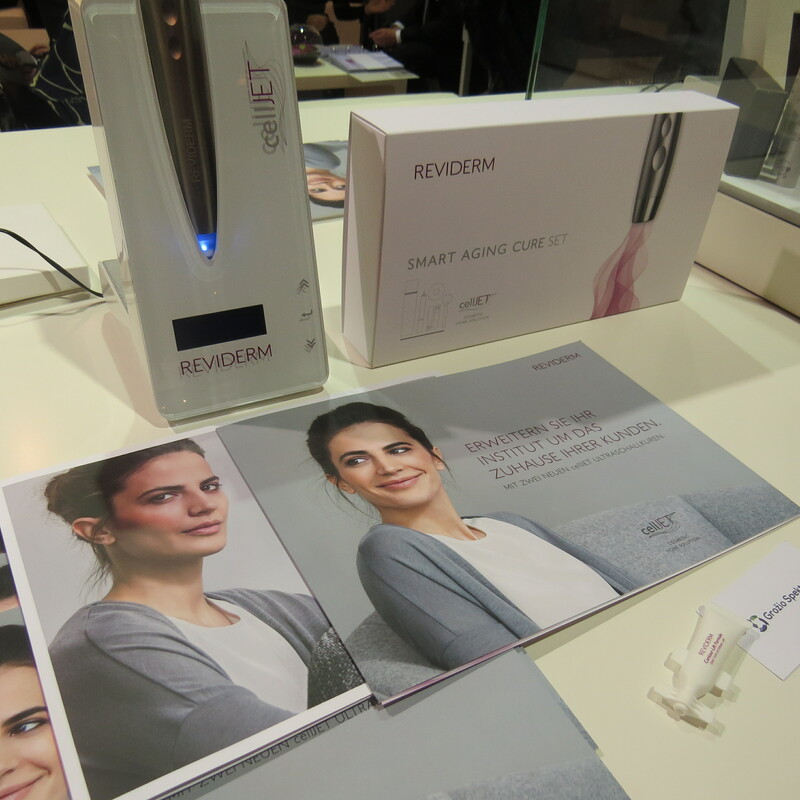 Another recent Reviderm innovation at the trade show was CellJet, an ultrasound treatment tool which can be used at home. It is part of a three-pronged anti-ageing treatment, the “Smart Ageing Cure”. First you receive a professional pre-treatment by a Reviderm-trained beautician, then you use the 14-Days Home Cure (a set which contains a pre-programmed CellJet pen and highly concentrated vitamin C spheres) and after two weeks, you return to the salon for a final treatment. Another mainstay of the German salon market is Dr. Grandel. The company has three major brands: Phyris and Dr. Grandel (skin and body care) and Arabesque (colour cosmetics). There are always plenty of Dr. Grandel launches to see at Beauty International and this year, I found the 5-sku SeeChange range in the Phyris brand particularly interesting. SeeChange is formulated with algae-derived ingredients (the company calls it the “Blue Evolution Essences”) and the products comprise three different moisturisers (including, of course, a sleeping mask! ), a serum and an eye & lip treatment. In the Dr. Grandel brand, the latest product launch is a line extension in the Beautygen range: Renew Pearls (see pic above. Very pretty looking). 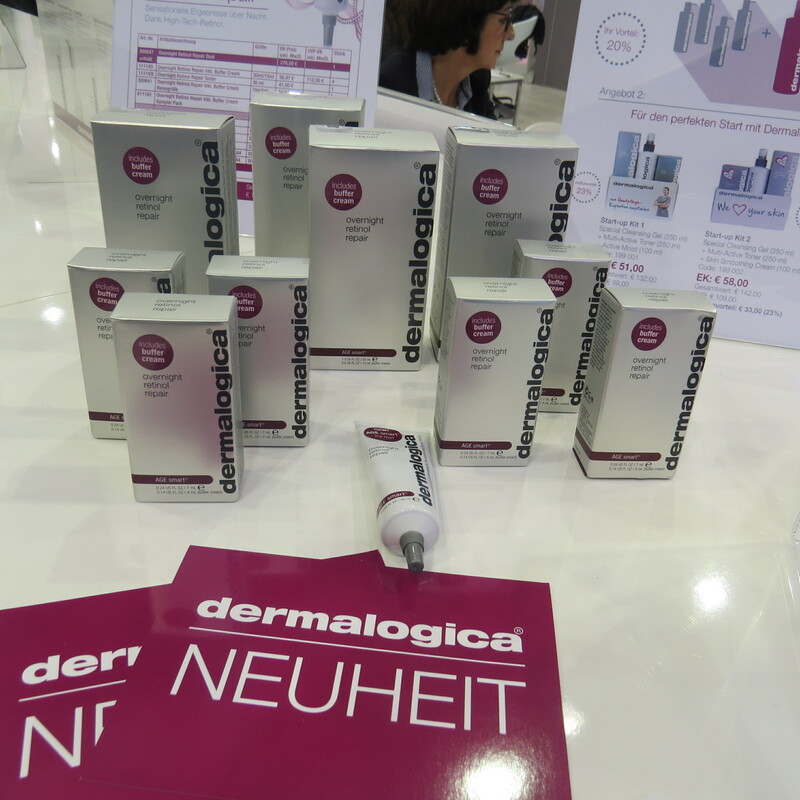 US brand Dermalogica is also very popular in German salons and at Beauty Düsseldorf, the company always has a gigantic exhibition stand. Their major new launch was Overnight Retinol Repair, an overnight skin treatment which contains micro-encapsulated retinol (vitamin E), stabilized vitamin C, peptides, ceramides and a copper-amino acid complex. The Retinol Overnight Cream is used together with the Buffer Cream, a mild hydrating moisturiser formulated with aloe vera. The Retinol Cream is mixed into the Buffer Cream so you can customize the percentage of the retinol, starting with a lower dosage (Dermalogica recommends 1 part Retinol Cream to 3 parts Buffer Cream) and then increase the dosage once your skin gets used to the retinol. 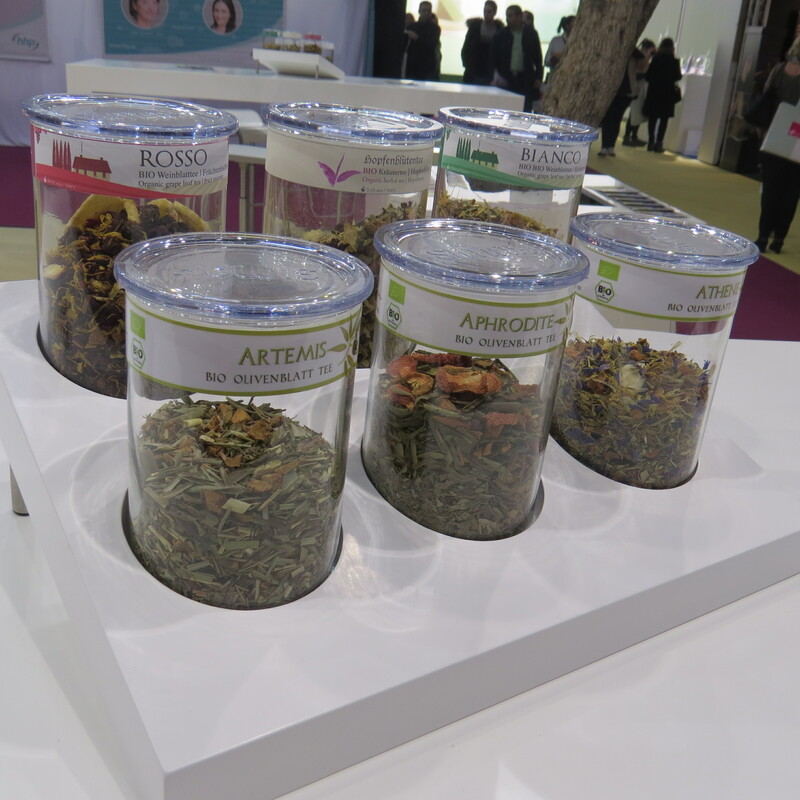 Although the majority of Beauty International’s exhibitors are from the conventional cosmetics sector, there were also some organic beauty brands at the show. 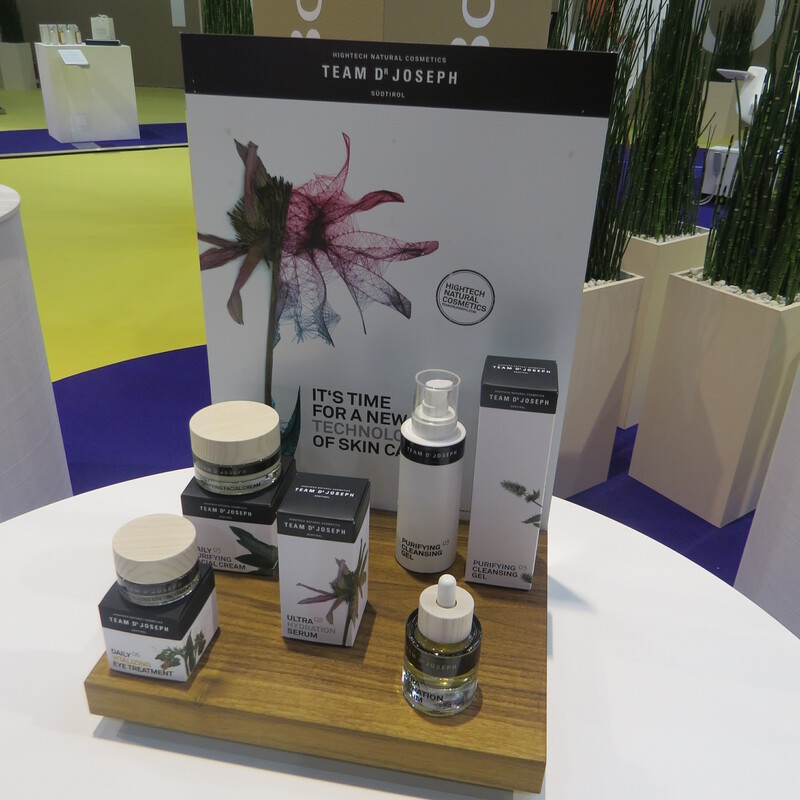 I was particularly taken with Team Dr. Joseph, a certified organic beauty brand from the South Tyrol region of Italy. Team Dr. Joseph was launched in December 2014; products are priced in the premium range (from 25 to 80 Euro) and they are only available in selected high-end retailers like day spas, hotels and beauty institutes. Check out the product design in the pics above; the visuals on the packaging are fabulous! And so are the ingredients of the seven product ranges: Moisturising, Energising, Eye & Lip, Purify, Calming and Well-Ageing. Team Dr. Joseph was also one of the winners in the Wellness & Spa Innovation Awards at this year’s Beauty International trade show. Congratulations! I also like organic beauty brand Pharmos Natur from Southern Germany. 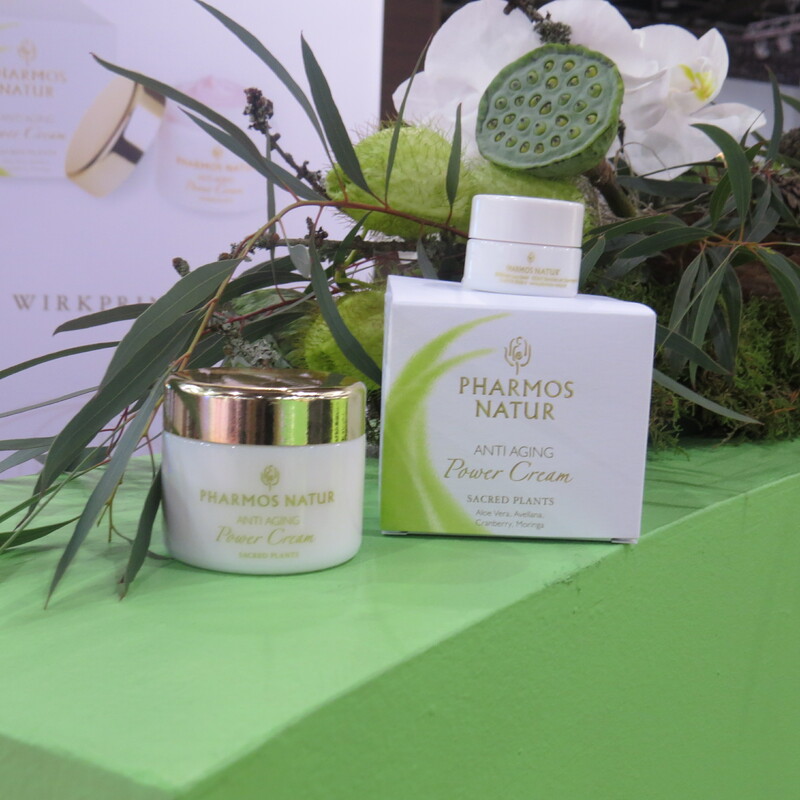 The Pharmos Natur products are based on organic aloe vera juice instead of water and the company’s latest launch is the Anti-Ageing Power Cream which was launched in November 2015. In addition to aloe vera, the cream also contains cranberry extract, avellana oil, moringa leaf extract, konjac root extract, vanilla extract and magnolia bark extract. Regulat is a well-known German beauty brand which is primarily retailed in Reformhaus stores and other organic and health food specialists. Regulat has an interesting concept: the products are based on fermented ingredients (the brand’s patented ingredients complex, the Regulat Cascade Fermented Organic Concentrate, is usually listed in second or third place on the INCI list) and the product portfolio also includes organic drinks and liquid concentrates. 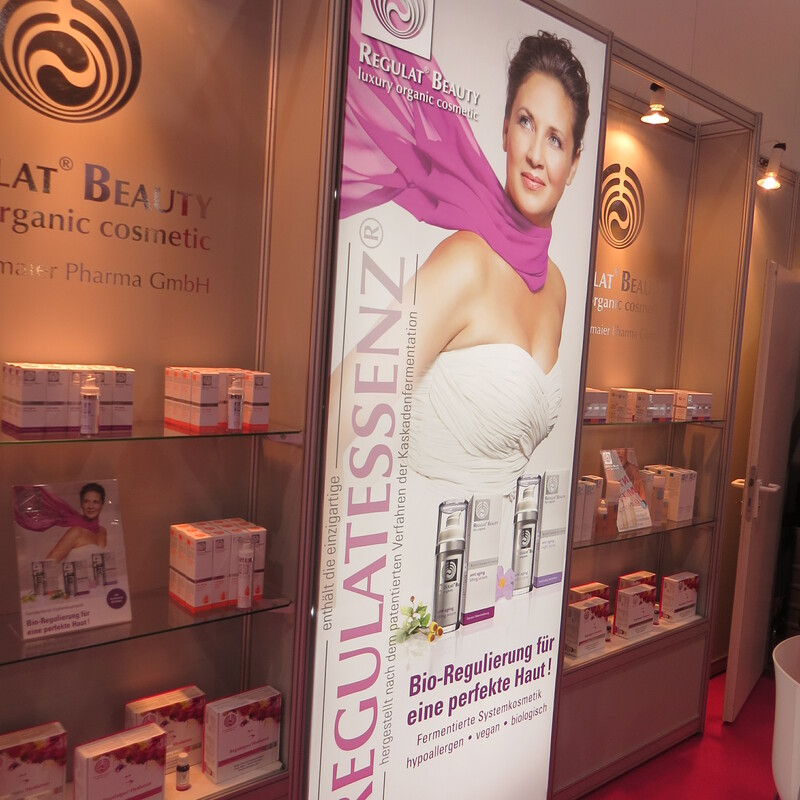 At Beauty Düsseldorf, Regulat presented it latest cosmetics launches – the Extra-Rich Anti-Ageing Cream and an Anti-Ageing Eye Cream, both launched in late 2015 – and the new Regulatpro Anti-Ageing Hyaluron Beauty Drink, a set of 20 small bottles which are to be taken as a three-week treatment. The beauty drink was available to try at the company’s exhibition stand; I thought it was quite tasty (vaguely fruity) and, of course, it is supposed to be really good for your hair, nails and skin! And now we’re going back to the conventional brands! I was excited to see Faby again – a nail care brand with a fabulous range of colours and very cool limited editions which I had first met at last year’s trade show. 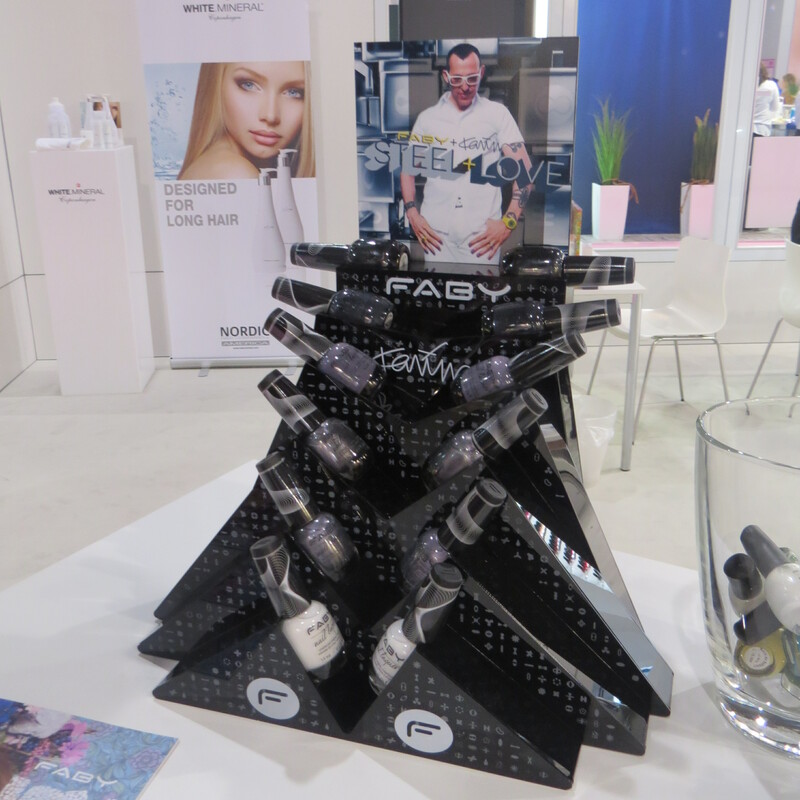 At this year’s Beauty Düsseldorf, Faby presented the new nail polish collections: Joy (spring-time colours) and Steel & Love, another special edition developed together with designer Karim Rashid (metallic greys, dark silvers and blacks; super stylish!). Faby will also soon launch UK brandMan Care in Germany (I was told that the products will be sold in selected independently owned perfumeries, concept stores and men’s clothing stoes) and another new non-nails product range is the four-sku premium hair care range White Mineral Copenhagen, which was launched this February. 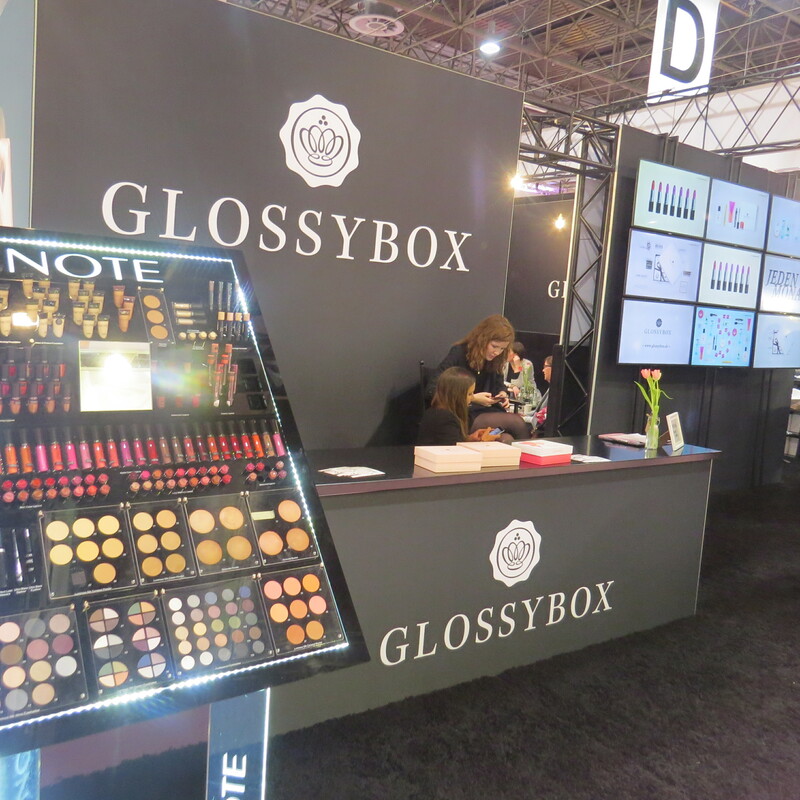 Two first-time exhibitors at Beauty Düsseldorf were Glossybox and Salonmeister. Both are Berlin-based Internet start-ups: Glossybox is the biggest beauty box subscription company in Germany and Europe while salon-booking website Salonmeister/Treatwell belongs to UK’s Wahanda which in turn was acquired by Japanese investor Recruit Holdings in May 2015. I had written retail profiles about Glossybox and Wahanda for CBM Magazine last year so I knew what both companies were about. Salonmeister was at Beauty Düsseldorf to promote their services, of course (beauty salons, spas and institutes can list their details on the Treatwell website so customers can find them more easily and book treatments online) but I was a bit puzzled about Glossybox’s presence at the show. The reason, however, is simple: not only does Glossybox’ brand line-up include popular salon brands like Biodroga but the company was also there to introduce a new Turkish colour cosmetics brand which will soon be launched in Germany. Note was founded in 2013 and is currently retailed in 20 countries worldwide (I was told it is one of the top makeup brands in Iran and that the company wants to expand their presence in Asia): with a wide range of colours and simple, stylish packaging the brand looks pretty good. Glossybox will be Note’s German distributor: starting this month the products will be introduced to customers through the company’s beauty boxes (excellent marketing strategy! A brand-new and exclusive colour cosmetics brand which is only available through Glossybox’ subscription model!) but I was told that eventually, if things go well, Note might also move into stationary retail in Germany. I think this makes Glossybox the first beauty box subscription company to also take on the role of brand distributor – I’ll be interested to see how this new business venture will work out. The company rep of Note, whom I met briefly at the show, also owns another beauty brand: Ottoman. The Berlin-based company was founded in 2006 and sells a wide range of hammam and spa products (body oils, massage gloves, olive oil soaps, hammam cloths, marble soap dishes and so on) which are based on traditional formulations and ingredients. 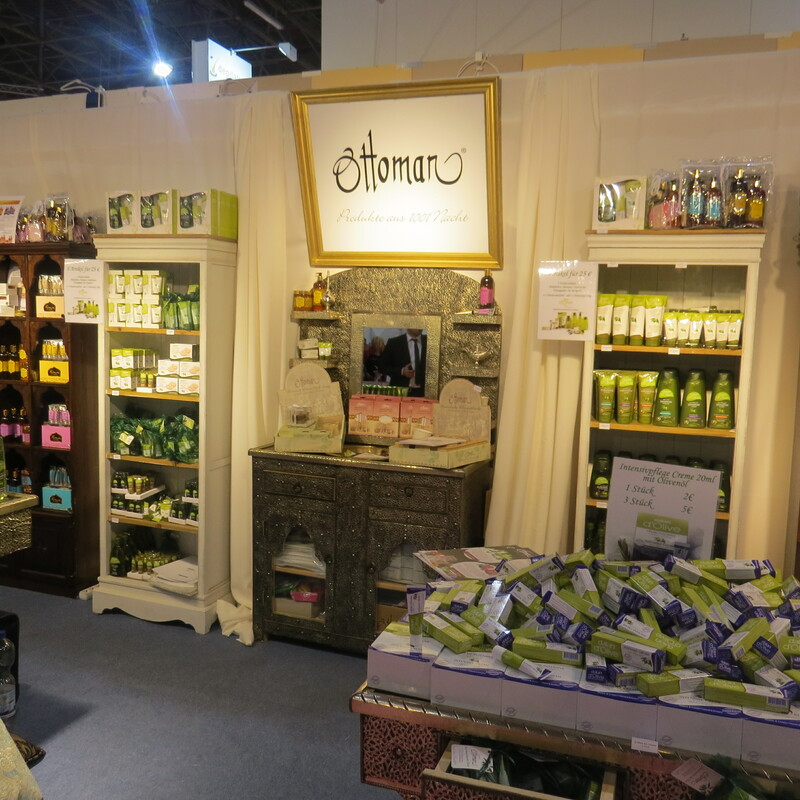 Ottoman products are available in various natural stores in Germany and I was told that in September/October 2016, the company will open its first store in Berlin. Always exciting stuff, Beauty Düsseldorf! The next trade show will take place from 31. March to 2nd April 2017.